When it comes to duck hunting, you can often distinguish the men from the boys before even setting foot in the field. How? By the quality of gear they have–especially their duck hunting waders. The best Waterfowl waders will stand up to adverse conditions season after season, especially in chilly waters. The best waders usually have reinforced knees and outer layers with anti-puncture technology. Some waders come in stocking-feet variety, meaning that you buy the boots separately. You’ll definitely want a pair with the boots attached to the rest of the suit, as this seals off any possibility of water entering. You may want to think of investing in insulated boots since it can get pretty cold in the marshes and the swamps in autumn and winter. It makes the most sense to buy a pair of waders with a camouflage pattern. Even though you’ll be spending a lot of time up to your stomach in water, you don’t want to handicap your hunt by standing out too much when you do venture out into the field. Allen Company offers a one-year warranty on its waders, so if you’re looking to try a pair out, these or the Shadowgrass Blades are good options. Specifically, the Jersey Mossy Oak Break-Ups’ quality starts in the boots, which are reinforced with 600g of Thinsulate and excellent arch support. Many reviewers who were searching for a cheap pair of waders were impressed by the quality for the price. Nevertheless, over the long term, a few users have expressed questions about the Break-Ups’ durability, and the fit can be a bit tricky, especially if your feet are disproportionately sized compared with the rest of your body. That said, most hunters have had positive experiences in these waders, and they’re worth a shot if you want a cheap pair. Another option from Allen Company, so you get the benefit of the one-year warranty with these as well. A step up from the Break-Ups in terms of insulation, the Shadowgrass Blades’ rubber boots are lined with 1000g of Thinsulate, so in theory, they’re 66% warmer for your feet. The camouflage pattern is also different than the Break-Ups, so depending on what the background looks like at your preferred hunting spots, these could be a better option. In terms of durability and quality, it’s much the same story as the Break-Ups – great for the price for a while, but long term you may run into the issues. Some reviewers have also called the chest too tight, highlighting that this product is intended for a long, lanky hunter. However, if you’re looking for a cheap pair, once again, Allen comes through in the clutch. If you’re on the shorter and stouter side, you may want to look elsewhere. If you’re deciding between the Break-Ups and the Shadowgrass Blades, think about whether or not you want the additional insulation and which camouflage pattern you prefer. 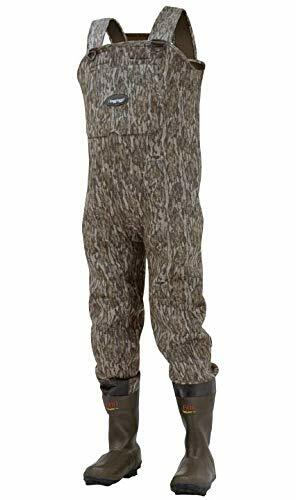 Finally breaking away from Allen Company, the Frogg Toggs Amphib waders are one of the more popular pairs on Amazon, and with good reason. The boots boast 600g Thinsulate insulation, and the seams are triple sealed – glued, stitched, and taped – to make sure that water doesn’t leak in. Furthermore, the reinforced kneepads are puncture resistant, ensuring that they’ll last longer thanks to extra muscle in this key, well-worn area. The Frogg Toggs Amphibs suffer from only a few chinks in the armor – the boots tend to run a bit big, and it’s tough to carry a shell holder on the Velcro straps. Otherwise, the Amphibs are reasonably priced, durable, and good-looking. Another pick that’s popular with Amazon consumers, the Frogg Toggs Bull offer a pocket with loops that can hold up to nine shells for convenient access. This is the main feature that differentiates the Frogg Toggs Bull from other waders. Though the waders themselves are solid, they are for the most part unremarkable, offering relatively normal protection. If it’s really important to keep your shells at hand, the Frogg Toggs Bull offer a certain convenience; however, be warned that the boots aren’t the greatest, and there’s next to no insulation. The Frogg Toggs Bull are definitely a warm climate set of waders, so bear that in mind when making your purchases. If you’re a serious duck hunter, and you have these means, these waders are about as good as it gets. Earning praise from numerous hunting websites and a whole host of awards – including Field & Stream’s Best of the Best award – the Swamp Tuff Pros are good enough to earn a category all to themselves, the darling of many hunting publications. The Swamp Tuff Pros feature a few innovations that are sure to make your experience in the marsh all the better. LaCrosse’s Armor Weld seam sealing process ensures that no water will seep through the games in these waders, and the Brush-Tuff facing deals comfortably with abrasions. A detachable shell pocket on the belt allows for easy access to your ammo and can hold an entire box of shotgun shells, and the whole thing is lined with 1000g of Thinsulate, ensuring warmth throughout your hunt. The boots boast great traction in all seasons, and the contoured ankle provides a great fit for everyone. As we mentioned, the only drawback here is the price. 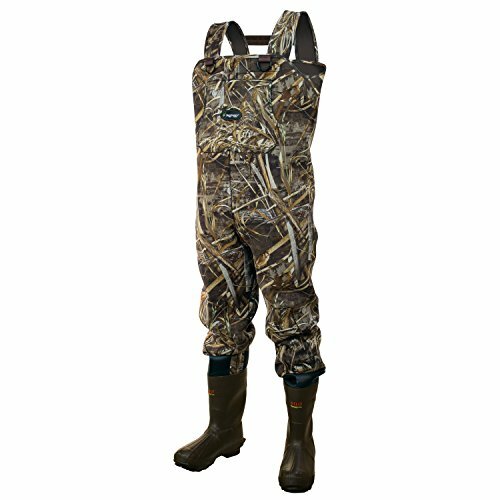 However, if you can afford to splurge, these waders will last forever and outperform pretty much any other pair. 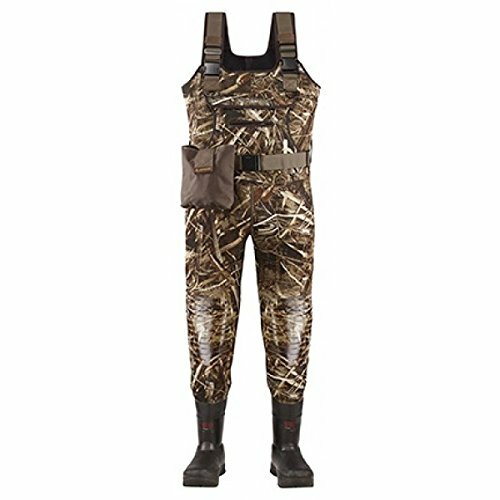 Though there are a lot of great duck hunting waders out there, we recommend the Lacrosse Swamp Tuff Pros. They’re a step up in terms of quality, provide great insulation, and you’ll have them forever. Trust me, when you’re chest deep in the marsh in the middle of November, you’ll be thankful for that Thinsulate and Armor Weld seam sealing system.